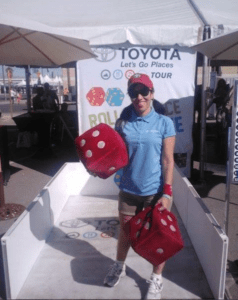 This is one of our Toyota Event Staffing Services. This time it’s the Toyota “Let’s Go Places” tagline and brand campaign. Attendees learned something new but also had a little fun. The staff on the picture carries a large fuzzy dice for prizes such as tote bags and SpongeBob sunglasses for one of the event activities. Just another example that working with www.NationalEventStaffing.com allows you to attend fun events and get paid all across Canada and the USA.